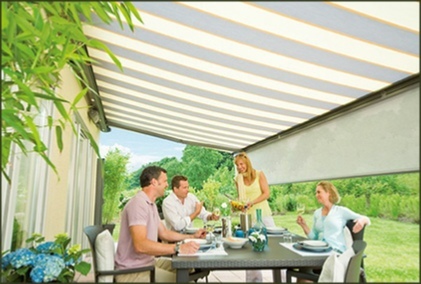 The new Opal Design II cassette awning stands out for its timeless classic design and groundbreaking technology. Made to shade large areas, it blends in harmoniously with its surrounding architecture and the attractive shape of the cassette adds a sophisticated element. A wide range of tempting and practical optional extras make it easy to operate and wonderfully convenient while also extending its lifetime. The spring loaded clip on end caps ensure the awning is reliably protected against the elements and dirt. The Opal Design II LED casts an atmospheric warm white light to extend patio use after dark. The Opal Design II Valance Plus provides the best possible privacy, as well as outstanding glare and sun protection.